Wu Changshuo (吳昌碩, 1844-1927) is a famous painter, calligrapher and seal-carver in the late Qing Dynasty. Changshuo is his courtesy name. His original name is Jun (俊), later Junqing (俊卿). Wu was born in today’s Anji County (安吉縣) of Zhejiang from a scholarly family and for a time toward the end of the Qing he served as an official in Liaoning. He settled in Suzhou in his twenties. Initially, he devoted himself to poetry and calligraphy with a strong interest in early scripts. 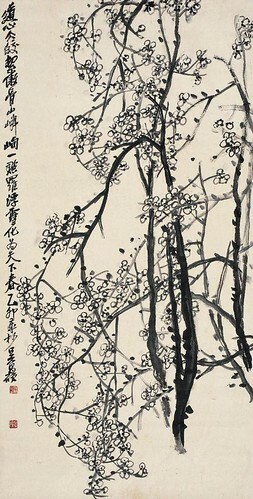 Only later did he consider himself a painter associated with the "Shanghai school." In 1913, he became the leader of a society of seal-carvers and artists in Hangzhou (西泠印社). As a leading painter during the early twentieth century, he was noted for rejuvenating the art of painting flowers and birds by introducing an expressive, individualistic style more generally associated with literati painting.